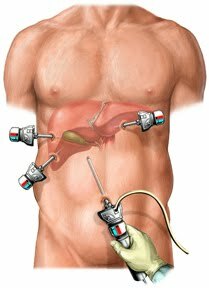 Laparoscopic surgery, sometimes called minimally invasive surgery (MIS), involves the insertion of a video camera and a variety of long thin surgical instruments through small "keyhole" incisions less than an inch in size. Although this technique was developed over 100 years ago, it did not gain widespread use until after the 1950's and has grown in popularity and acceptance since then. First used in only the most simple of abdominal and pelvic procedures, the complexity and variety of surgeries now performed laparoscopically have greatly expanded in recent years. Although laparoscopic surgery has most of the same risks as traditional open surgery including possible hemorrhage or adverse reactions to anesthesia, there are many advantages that have made laparoscopic surgery popular. These benefits include reduced post-operative pain, more rapid recovery, shorter hospitalization, smaller scars and a quicker return to normal activities. Regretfully, there are also additional risks associated with laparoscopic surgery and these risks often lie at the heart of any litigation involved. Before we discuss the risks of laparoscopic surgery, it is important to understand some of the specifics of how these surgeries are performed. 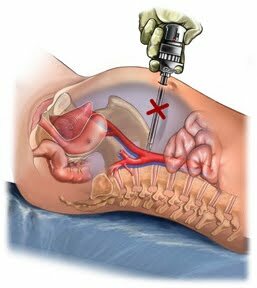 At the beginning of a laparoscopic surgery, a special needle (Veress needle) is inserted into the abdomen allowing the abdominal cavity to be filled (insufflated) with CO2 gas. This creates a gas filled space in which the surgical instruments can operate. 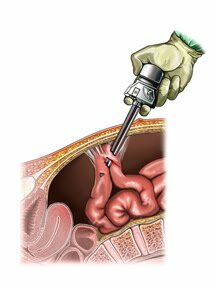 Next, after small incisions are created in the skin, sharp metal cylinders (trocars) are punched through the abdominal wall to create portals through which the laparoscope and laparoscopic instruments can be inserted. The risks associated with laparoscopic surgery that I encounter regularly are primarily associated with these initial Veress needle and trocar insertions, as well as a few other technical limitations of the laparoscopic technique. The insertion of the Veress needle and the trocars are a risk because these sharp metal instruments are inserted blindly into the abdominal cavity. If proper procedures are followed, they are inserted into areas least likely to cause injury in a normal person, but accidents happen and procedures are not always followed, therefore these instruments can result in serious injury. Perforations of the small bowel, colon, stomach, liver or spleen can occur. Also, major arteries and veins are at risk including the aorta, inferior vena cava and iliac vessels. Perforation injuries are among the most common injuries unique to laparoscopic surgery. Certain technical limitations also contribute to the risks of laparoscopic surgery. While traditional open incisions offer a more complete exposure and control of the surgical area, open procedures also allow the surgeon to feel the structures being manipulated. Laparoscopic surgery offers only a limited view of the operative field and none of the tactile sensation of traditional surgery. The view through the laparoscope prevents normal depth perception and provides only a view of a limited portion of the abdomen where the camera happens to be aimed at any given time. These limitations can lead to increased risks of intra-operative injury, but also can lead to a failure to recognize injuries when they occur. Whether it is a bile duct injury during laparoscopic cholecystectomy, a bowel perforation during laparoscopic hysterectomy or a vascular injury during laparoscopic sterilization, we are most often called upon to illustrate the consequences of the surgeon's failure to recognize and timely repair the damages that occur. These consequences can include peritonitis, sepsis, hemorrhage and even death and the argument is often made that the original damages would most likely have been recognized had the procedure been performed through a traditional open exposure.